Crossed Preview, originally uploaded by NiteMayr. So, where have you been hiding, comic fan? Over in Marvel and DC? In that nice shiny house on the hill, I bet you think that Vertigo comics are edgy too? While DC and Marvel had quietly cast off the Comics Code, Avatar Press has some of the most violent, edy and REAL comics out there. Did you get a chance to read “Black Gas” , how about “Black Summer”, maybe you have read “Gravel”? 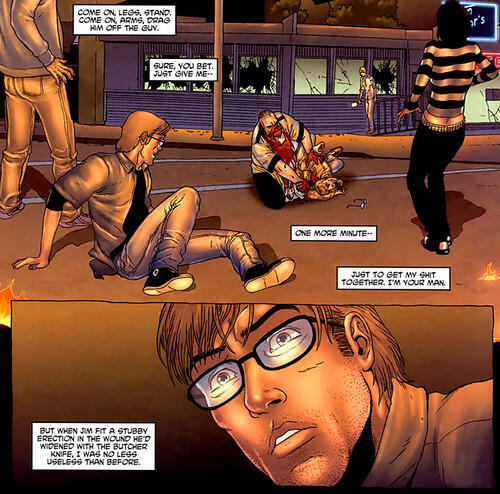 Avatar Press continues to be THE source for creator owned, outside the norm comics. Crossed is yet another great example of that work. Like any good Apocalyptic fiction, the author throws the unsuspecting protagonists into a scenario that initially seems ridiculous or unlikely, abruptly tossing them into the fire with no obvious hope for safety. There is a reference to people becoming inured to the ridiculous by instantaneous media like Youtube or Break.com and I think there is something in that, if you saw a Zombie on the street eating an arm, wouldn’t you look for the camera too? Garth Ennis continues to deliver Edgy comics and now that his Run on Punisher is over (boo) what can we look forward too? Crossed.